In the late summer of 2000, several members of the Dallas West Church of Christ met to discuss the demographics of the membership. It was determined that one quarter of the congregation’s members were commuting from heavily populated and fast growing Southern Dallas County and communities south of Interstate 20. As a visionary, our minister emeritus seized the opportunity to further the cause of Christ in a new territory while addressing the needs of the members. Therefore, the idea of a new church was born. Central Pointé Church of Christ was conceived in love and dedicated to the belief that there is one faith and only one Church, the Church of Christ. In September 2000, thirty members held their first Bible Class in the chapel of the Cedar Crest Place Funeral Home. Our Minister Emeritus, Reginald B. Dulin, led the class. After several meetings and services which were conducted at various locations, the congregation settled at 1003 N. Cockrell Hill in Duncanville, Texas on October 1, 2000. With the faith needed to succeed and the knowledge that God would provide, the congregation purchased this facility. The congregation grew rapidly, and soon additional leadership was needed. G. P. Holt, Sr., a pioneer minister in the Church of Christ became a part of the Central Pointe leadership. In the following months, the congregational growth continued and overcrowding became a good problem that was remedied by the addition of a second Sunday worship service. The membership grew to 500 members. God continued to bless this work and by December 2001, the membership had grown to 650 members. In January 2002, a closed circuit television was added to a large classroom to accommodate the overflow crowds. In 2003 Central Pointe purchased the property located at 7440 S. Westmoreland Road, Dallas, Texas and began renovations in preparation for locating to a larger facility. 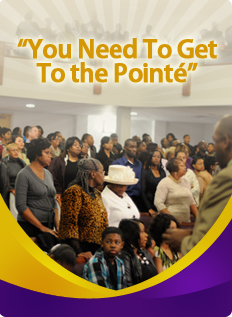 In its five years of existence, Central Pointe grew to a congregation numbering over 800 and served the spiritual needs of members throughout Dallas, Southern Dallas County, Ellis, Navarro and Tarrant County. Prior to the completion of our new facility on Westmoreland, God blessed us to finalize the sale of our facility on Cockrell Hill. We were excited about the idea of erecting a tent on the parking lot of our new facility. This allowed us the opportunity to worship God for three months outside where the surrounding community could hear the Gospel. The first service in our new facility was on Father’s Day, 2005. We have continued to experience tremendous growth. On July 20, 2006, Rodney D. Dulin was named the Senior Minister after the resignation and subsequent death of Reginald Dulin. Souls continue to be saved and families strengthen under the leadership of our dynamic young minister, Rodney Dulin. On June 7, 2009, God blessed us to dedicate the Dr. R. B. Dulin Children’s Worship Center in our existing facility. Our young people will have the opportunity to further grow and develop within the confines of their own auditorium. We pray to continually serve Christ as the scriptures teach and to always give God the praise and thanksgiving for every achievement and for each blessing.